By Graham Vanbergen: In the book – Brexit – A Corporate Coup D’Etat one chapter is dedicated to government officials intimidating business leaders with career-ending threats and business losses for speaking up about the impact of Brexit, another is about the scale of gagging orders the government have used to legally silence them. It has now emerged that in addition to the above, 16 drug companies and 10 trade associations have been asked to sign non-disclosure agreements (NDAs) which prevent them from revealing any information related to contingency plans drawn up with the Department of Health and Social Care in the event of a no-deal Brexit. The government has now told at least 60 so-called ‘partners’ working on no-deal preparations across Whitehall to sign these legally binding gagging orders. This continues to anger transparency campaigners who get little or no mainstream media coverage in the right-wing press such as The Times, Telegraph, Mail or Express – or indeed on televised media. The BBC has remained completely silent on the subject. Throughout the entire period of Brexit negotiations, Theresa May’s style of government has been one of secrecy where they have been consistently accused of controlling the release of information about no-deal preparations to try to force Conservative MPs to back the prime minister’s Brexit agreement through parliament – the next vote is on 21st January. It is at best hypocritical of the PM who herself previously condemned the use of gagging orders by employers. She told parliament in October that it was clear they were being used “unethically”. It is difficult to imagine a more unethical act to stop critical information being shared where lives are at risk. 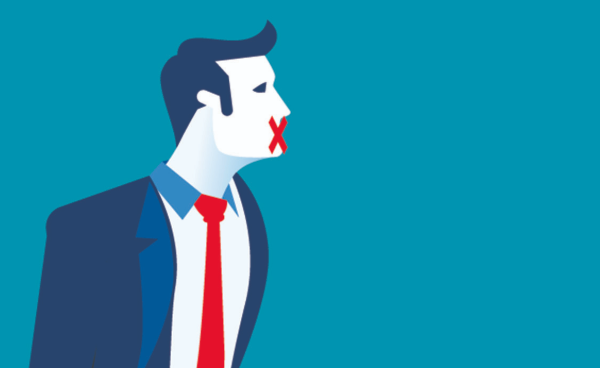 It is one thing to silence those in the know for expressing personal views when working so closely with government officials, it is entirely different to silence those when it is in the public’s right to know about any threats to public health. Whitehall has been so secretive that information is only being provided to firms orally. Apparently, even hard copies of documents must be returned at the end of meetings. The threat of a no-deal Brexit, be it managed or otherwise, has seen the pharmaceutical industry stockpiling drugs to ensure access to vital medicines if supply routes are disrupted by delays at the border. People’s lives could be at risk and yet the government still feels that getting their version of Brexit through on the 21st January is done so at any cost. The Guardian reported that as far as meetings go: “People attending meetings with civil servants are required not to divulge what they have heard, not to take or make a copy of any papers provided for a meeting, and to return at the end of each meeting where requested any papers or material provided by the department”. Last week, Matt Hancock, the health secretary, was criticised for apparently boasting that he had become “the largest buyer of fridges in the world” as part of a plan to stockpile essential medicines. It should be noted that the Pharmaceutical industry does not recommend the use of fridges for critical life-saving products. In the meantime, the government has set up a team of troubleshooters to tackle problems in the NHS in the event of a no-deal Brexit. Matt Hancock said he was arranging for special flights to bring medicines from the Netherlands to beat anticipated shortages. In a British Medical Journal opinion piece, the Chair of Health and Social Care Select & Liaison Committees and a GP backing the People’s Vote wrote: “The message from the majority of clinicians and scientists is clear; Brexit is bad for our health. It will be harmful for people who rely on the NHS, research, social care and public health as well as for the workforce on which these depend. “We are about to knowingly, and avoidably, inflict reckless damage on the close partnerships in healthcare, built up over decades, and in place at every stage from research and development, to medicines and devices arriving in pharmacies or hospitals. A new report, Brexit and the Health and Social Care Workforce in the UK, by the National Institute of Economic and Social Research (NIESR), also highlights the vital role of EEA nationals across social care as well as the NHS, and the scale of the threat to recruitment and retention as a result of Brexit. The NIESR report forecasts an additional potential shortfall of 5,000 to 10,000 nurses in the NHS in England by 2021 on top of existing vacancies, which stood at 41,722 (11.8% of all positions) at the end of June 2018. EEA nationals also play an increasingly important role in social care, where the numbers employed grew by 68 per cent, or 30,600 people, between 2011 and 2016.